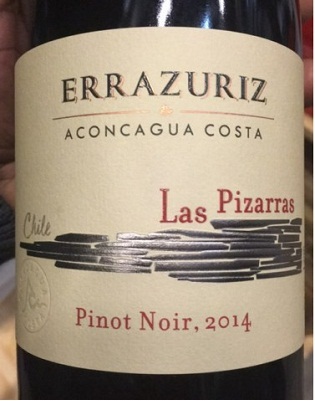 This new wine is sourced entirely from Errazuriz's Aconcagua Costa Estate, from specific lots that have a significant component of pizarra (schist). Given the extremes of this cool climate site, and diversity of the soils and elevations, each small block ripens at its own pace. Proximity to the cool Pacific Ocean andwell-drained soils with high level of schist and metamorphic rock allows the Estate to produce Pinot Noir with exceptional complexity, depth, minerality, and natural acidity. The nose is intriguing, with layers of cherry, wild strawberry, rose hips, violets with delicate spicy notes of tarragon and dill. These elements carry over to the palate, accompanied by fresh notes of raspberries, cherries and nutmeg. The palate has great depth, with fine-grained tannins gliding gracefully with precision and structure from the cool-climate, coastal acidity. 2014 marks the first vintage release. All fruit (80% de-stemmed, 20% whole cluster) was hand-picked and rigorously hand sorted prior to going directly into small open-top fermenters. 75% of total fruit was cold macerated at 8 to 10ºC for 5 to 7 days prior to 100% native fermentation, followed by an extended average maceration period of 25 days. The cap was kept moist by daily gentle punchdowns by hand. Free-run wine was drained and cellared in 100% French oak, 50% new, for 14 months. "For such a young wine, there are very complex aromas that already point at notes of forest floor, mushrooms, truffles and game, not only wild berries and spices; it is subtle, fine and layered in a way that made me think of a wine from René Engel. There are some notes of rusty iron, blood and earth, and an absolute absence of balsamic aromas or notes of wood. The palate is medium-bodied with fine acidity and tannins, but with plenty of grip. Most would place this in the Côte de Nuits." "Elegant and full of concentrated red plum and red currant flavors, supported by fresh acidity. Minerally midpalate, with a finish of white pepper and dried herbal notes. Drink now through 2020."